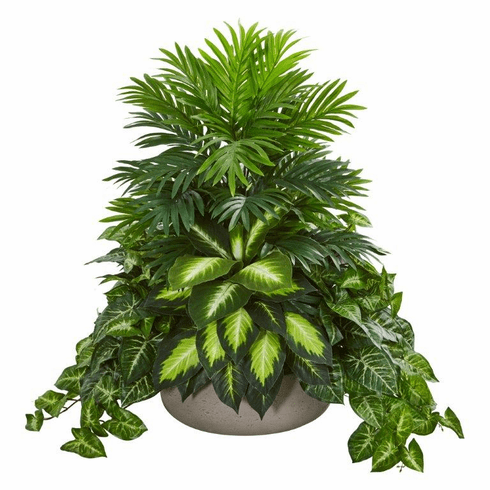 Starting from the top to bottom, the artificial mixed greens plant sports a lush appearance�with its various green and slightly variegated leaves that spill over the included stone planter. Closely resembling an outdoor plant, you can use this ornament to add a bit of greenery into your living space by placing it on a designated plant shelf with other artificial potted plants. Size: Height: 28 In. Width: 26 In. Depth: 26 In. Pot Size: H: 5.25 In. W: 13 In. D: 13 In.